Since the VR technology requires an expensive, gaming computer to run properly, an individual purchasing the equipment could easily invest more than $1,200. The library has been able to integrate the new technology into different programs they can offer the community which has led many teens to request a job simulator game. Pictured is Anna Jackson demonstrating one of the many experiences VR has to offer. This year’s summer reading program has a space theme, so she is also hoping to incorporate VR into the program. For instance, there is a game which allows the user to walk around and explore the international space station. 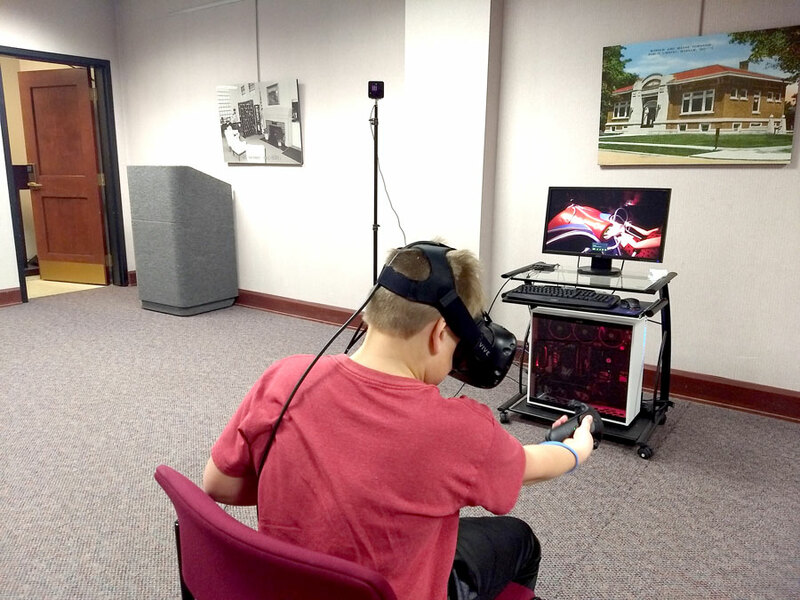 WARSAW — When it comes to virtual reality gameplay, it did not take much for Tyson Barnett, Warsaw Community Public Library’s information technology supervisor, to become hooked. After purchasing his own virtual reality set for Playstation, he brought it in to the library for his fellow employees to test. 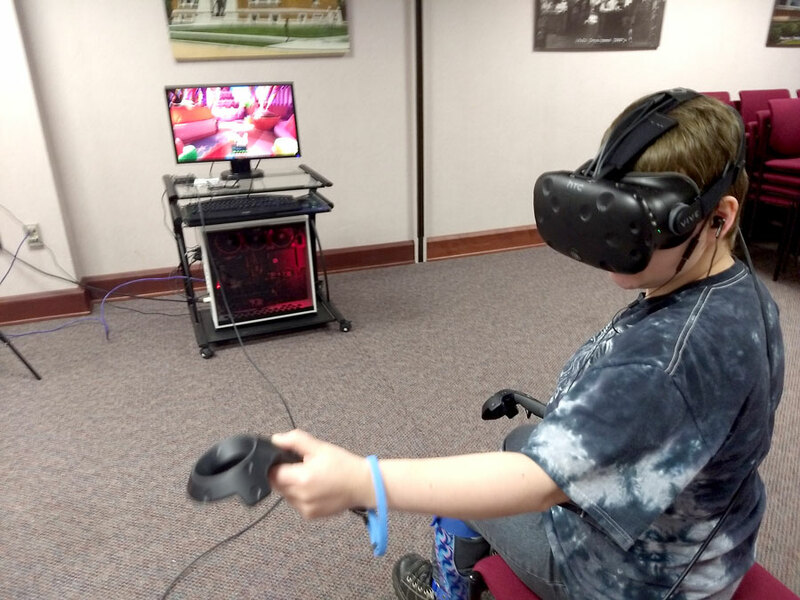 As a special treat for the end of the summer reading block party, the library brought in Roy’s VR and it was a huge success with the block party participants. While the state has VR technology they lend to libraries, the wait list is long and the library does not get to keep it for very long. 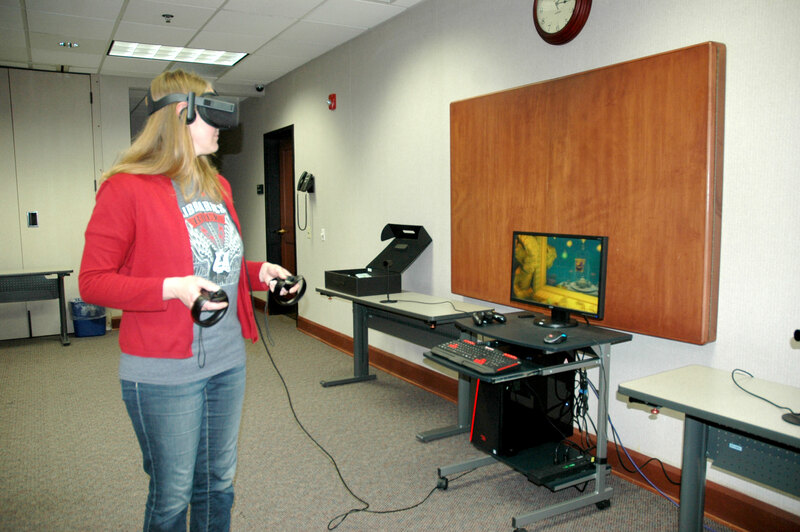 This inspired the Warsaw Library to purchase its own Oculus Rift VR system a little more than a year ago. “We try to stay on top of new technology,” Anna Jackson, teen and young adult librarian, stated. This led them to also get an HTC Vive system thanks to money donated by their Friends of the Library group which just debuted last month. Owning two VR systems, which is incredibly rare for a library, allows it to “let people experience VR because it is such a new technology,” Jackson explained. It has become extremely popular among all age groups, from older kids to senior citizens. Currently the library is able to offer access to its VR systems at least three times a month in the teen drop in zone, adult drop in zone and a new VR club. Jackson commented, “We could probably do VR every week and still have a wait list.” At each event there is a sign up sheet to test the virtual reality in 15 minute increments. This allows up to 20 people to play VR during the two hour window utilizing both systems. However, the library is experimenting with different days and times to best reach the community in the hopes of adding more times to test the VR technology. The Oculus Rift system has many favorite games that are free. For the HTC Vive, Barnett described how the library has a subscription to try five new games each month. Part of his job is to provide quality control by testing games to decide which may be worth purchasing and what the community may enjoy the most. When either of the systems gets a new game, Jackson and other employees who assist with the VR club and drop in zones must test the games so they can help first-timers. “We have to play the games so we’re familiar enough with it to walk people through it without seeing what they’re seeing on the screen,” Jackson commented. Since each person only gets 15 minutes to play, she believes each person should get the most out of those 15 minutes. Aarin Hawblitzel tests out a game on the HTC Vive during one of February’s virtual reality drop in events. Brittany Ousley gets into the HTC Vive at the Warsaw Public Library.